The 2009/10 academic year has seen the opening of two new college complexes for Rice University in Houston, Texas. The Rice McMurtry College and Duncan College comprise two 5-storey residential dormitories providing 650 bedspaces. 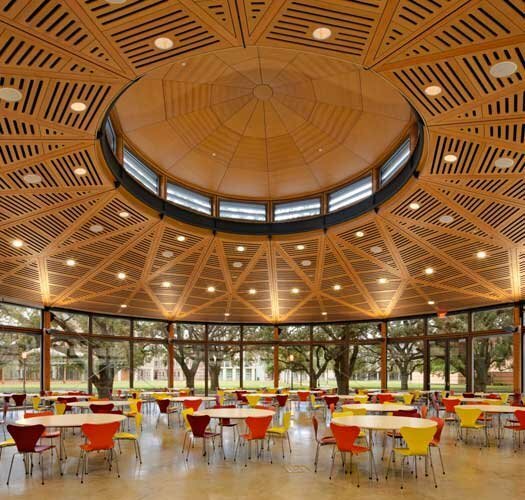 Each College has its own dining hall, known as the Commons, and a 2-storey residence to house the College Master, smaller dining rooms and a library. The Campus was established in 1913 and has been carefully developed as a highly consistent collection of finely detailed brick buildings, many laid out as collegiate quadrangles, set amongst a rich environment of mature oak trees. The new buildings continue the language of the quadrangle and are linked throughout by shaded arcades, creating two new communities for the University. We worked with Virginia based firm Hanbury Evans Wright Vlattas, who were the Architect of Record on this project.